...and I paid the extra to see it in IMAX since I was already aware that the IMAX version had more stuff on the screen. (IMAX made Dunkirk so much more impressive and immersive. and covers his career from an X-15 test flight to the splashdown of the Apollo 11 mission. However, the film focuses heavily on the loss of his young Daughter and how that affects his personality and his work. Although I am a nut for anything Space, NASA, Moon Missions, etc., I can't honestly say I liked this film. Shaky cam. Never been a fan of the hand held, close-up, shaky camera approach to film and TV. And its used a lot here. Sensory overload. In an effort to put you into the story, the filmmakers resort to scenes that disorient, confuse, and become almost painful to watch. The film was also very loud where I saw it. Too loud. CGI. Primarily only used in the final moonwalk scenes, it was not impressive or realistic by today's standards in my opinion. And, the IMAX full screen experience...only kicks in for the final ten minutes on the moon. but its disappointing that thats all you get. The previous two hours is all standard letterbox movie format. I didn't really know anything about Armstrong's personal life, so this movie is enlightening. but its surprising to find out that even 40 years later, he still couldn't talk about it. The opening X-15 moments are powerful. And from what I understand, very accurate. Many important aviation moments are covered (albeit briefly) in the film. The acting is top notch...the actors are all well suited to their roles. And the film doesn't stray from the meat of the story. There doesn't appear to be much dramatic extension. The majority of the film is quite depressing and I didn't get the pump that I still get from repeated viewings of The Right Stuff. I really wanted First Man to be some sort of sequel...the Right Stuff 2...but its not. So, thats my disappointment...maybe you will have another view. I get it...its hard to tell a story that everyone already knows the ending. You have to try to focus on another part of the story. In this case, its the fine line Armstrong walks between the personal loss and the extreme dedication to his work. For me...I guess I wanted more Rocket Fuel and Moonwalking. I give it Two out of Five Stars + One Star for technical effort. On a related note...this past week (November 2018) saw the huge estate auction of space related memorabilia belonging to the Armstrong family. 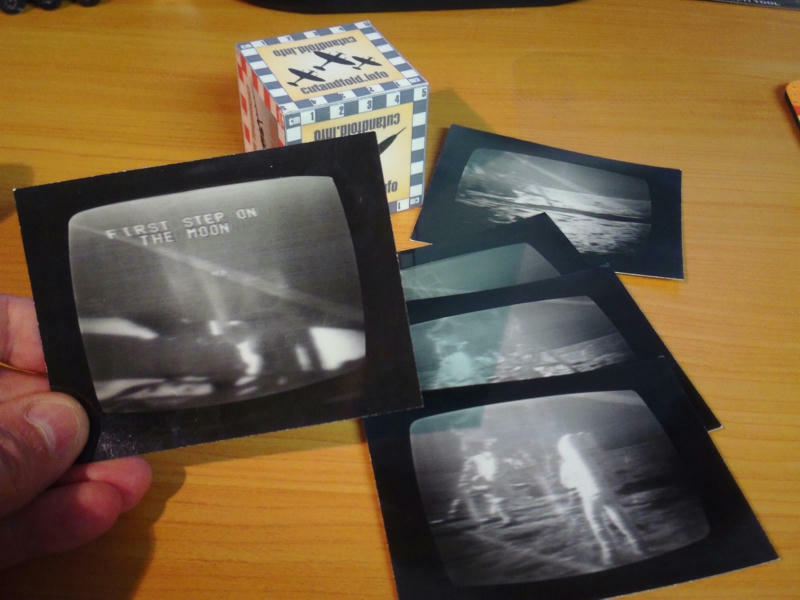 Its amazing some of the items (actually intended to be collectibles and souvenirs) carried on the Apollo 11 spacecraft to the moon. and multiples pieces of Orville and Wilbur Wright's first aircraft (propellor slivers and wing fabric swatches). that was carried to the Moon surface in the LEM, which sold for almost half a million dollars. Last edited by airdave; 11-05-2018 at 10:43 AM. Saw the movie a few weeks ago and I was impressed. Unfortunatly there's no Dutch translation of the book, yet? Impressing the film was: the audience left the theater silently. So if you want a truly exciting few hours with lots of rocketry and booming this film is a no go... but when human interested: recommended! And there is still noise! I haven't seen the film but I have read the book. It is a very large volume of 500+ pages of biograpic story and 100+ pages of source references and acknowledgements. I finished the book but is was very dry and often quite boring. Armstrong was not the most flamboyant and controversial person. He wasn't that at all, actually. The movie only played here in my city for a couple of times at impossible to get to timeslots. From what I have seen (trailers) and read (reviews) the film also focuses quite heavily on Jan, his wife, for some necessary emotional stuff. Is that true? I think Neil Armstrong was a very, very rational man and in that sense he could kind of lock himself out of the emotions inside of him. He might not really have been that able to cope with his grief and sadness. I can kind of relate to that. And I think they focused on that part of his life, because all the rest of it was well, quite rational. Even his brushes with death were dealt with in a rational way. I also heard people complained about the role of Buzz Aldrin. He apparently was depicted as a lout. I think a film on Aldrin's life would probably be a lot more emotional and intense. Armstrong was quiet, driven, introspective and dedicated to doing the job. He didn't want fame, notoriety or any celebration for his work. Buzz Aldrin is an accomplished Pilot and Astronaut who did his job. But Buzz was interested in the limelight. I think he would rather have been the "first man" for obvious reasons. Still to this day, Buzz is acting the part of a "celebrity", and although he does it all in the name of promoting "Space Exploration", I think he really just enjoys being a "star". I don't think they were friends...but I think they were professionals who got the job done. The movie did make Buzz look like a disagreeable and jealous type. Whether he was, I'm really not sure. But it wouldn't be a huge surprise if it was true. I just read, at 88 years old, Aldrin is suing his own children and agent claiming they have stolen money from him. Dave, I fully agree with what you wrote. It's just that Buzz's story might have made for a more exciting movie. His flying days in Korea, his relation with his very demanding and pushing father, who wanted him to be the best in everything. Even up til the point that Aldrin sr., who (if I recall correctly) was a high ranked senior officer in the military, lobbied at NASA to get his son in the commander's seat or at least to be the first to step off the ladder. Aldrin's frustrations, his alcoholism and his resurrection, all good ingredients for a good psychological drama. Yes, he wants to be in the limelight. That doesn't make him bad or less interesting, though. I think his whole life story just is interesting. And I was honestly surprised that they chose to make a movie out of Armstrong's life, although I understand the reasons, of course. Like you said, Dave, Armstrong indeed was an extremely humble, modest and reclusive person. Brilliant, probably one of the last real stick-and-rudder men of the astronaut corps, and it often seemed he'd rather forgot about that little moon trip he once did. That is true. That is why I think the film perhaps focuses more on the dangers of the missions he flew and the terrible loss his family suffered. Saw it. Loved it. Watched the real moon landing on TV in 1969. I have yet to see this film.People who saw it were a bit disappointed but they say "it's still worth watching". On related note there is a 2013 Russian film "Gagarin.First in Space" and 2017 "The Spacewalker" (original title was "The Age of Pioneers"). Not big budget films so not LOTR quality but still watchable and decent. I, too, watched the Moon Landing on television in 1969 and was glad to have seen this film, although I agree with Dave that the shaky, ultra-close up, hand-held camera work was disconcerting to me. I do not like that trend in cinema. I knew it was coming, but the fiery deaths of Gus Grissom, Ed White, and Roger Chaffee really shook me, as it did when it happened in 1967. I heard the news over Armed Forces Radio in Vietnam and then read about it in Stars & Stripes. Having been avidly following the space program from the beginning, it was like losing friends. I think the close-up shaky-camera work was to create a sense of just how tight the cockpits were and just how much the rockets shook on take-off. It seemed they wanted me to feel like I was in the seat, and it worked for me. But I do understand the complaints. The Gemini 8 mission caught me off guard. I really felt like I was there for those scenes! I was panicking in exactly the way Neil wasn't! I really only knew about the Apollo missions. I was born in 66 and don't actually remember watching Apollo 11. I barely remember watching one of the later moon missions later in school. The Apollo 1 fire was very intense, also. It took a lot longer that I had thought. I wasn't aware that they had been aware of the fire for so long. I had always thought it was a momentary flash for them. And the moon landing was extremely well done! It really gave a sense of just how close to the wire the landing was, but Neil kept his composure and made it sound like the most boring thing he'd ever done. Listening to the audio, CAPCOM's reply about everyone about to turn blue always seemed out of place until you know just how close they came to not making it back. I saw Buzz once at a book signing last year. I wouldn't call him a publicity seeker, but he doesn't hide from it the way Neil did. Neil seemed to view everything as just what happened to fall into place for him. He never pushed or even asked for anything in the program except the chance to do his best. Buzz seemed a bit more driven and losing first step seems to have weighed heavily on him for quite a while. Now he prefers to talk about being on the first mission with Neil. I'm sure NASA understood both men and chose their roles according to the best needs of the mission. I just hope SpaceX can get us back on the path to space exploration again. Yup...I can remember getting up to watch the Moon walk on TV. We took photos, which I still have the original prints. My dad set up a tripod in front of the 12" B/W TV, using a small Leica camera. I can also remember news and reports in school. I believe we watched Apollo 11 splashdown at school. And I remember reports during the Apollo 13 mission.